LIFE HACKS #823 COUGH KEEPING YOU UP AT NIGHT? PUT VICKS V - ProudMummy.com the Web's Community for Mums. LIFE HACKS #823 COUGH KEEPING YOU UP AT NIGHT? 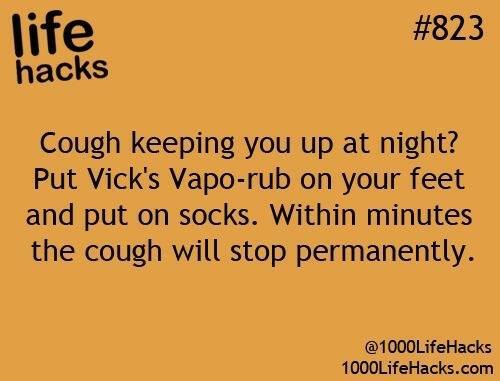 PUT VICK'S VAP-RUB ON YOUR FEET AND PUT ON SOCKS. WITHIN MINUTES THE COUGH WILL STOP PERMANENTLY.